Giulia Scarpaleggia uncovers a host of spiced, almond flavoured bakes made specifically for Christmas in one of Tuscany’s most beautiful cities. 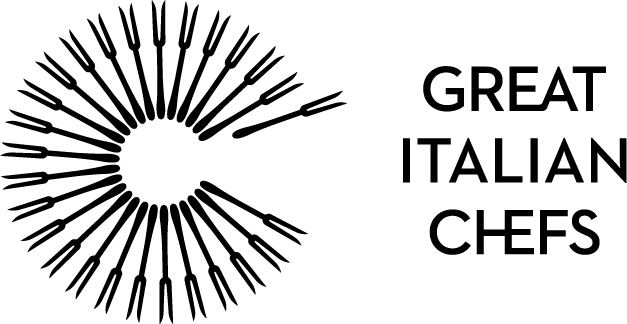 Siena is known for three things; being a UNESCO World Heritage Site, the Palio, a colourful and historic horse race held in the main square of the city twice a year, and its cuisine. 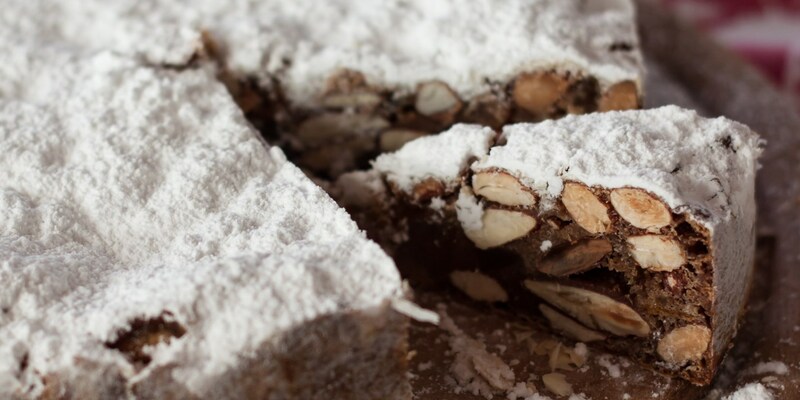 At Christmas, the city’s bakeries and delis begin stocking local specialities made especially for the festive period, and almost all of them include almonds; an ingredient the city was once famous for. Here are some of the most popular sweets associated with Siena. Panforte is a thick, dense cake of medieval origin. At first it was made by the monks in the monasteries and given as a symbolic gift for special occasions, before becoming something associated with Italian apothecaries. Sugar, almonds, candied fruit and spices were ingredients as precious as gold and were kept in huge glass jars on dark wooden shelves by these people, who were a mix between alchemist and pharmacist. Spices give panforte a unique flavour, turning it into a kind of Tuscan gingerbread. Its pungent and honeyed smell is, for me, the true scent of Christmas, along with that of almonds and orange peel. Making panforte is simple. Even though the ingredients are numerous, they are readily available. As in many traditional Italian recipes, the secret lies in the quality of the ingredients; crisp almonds that leave a milky freshness in your mouth and excellent candied fruit. Do not trust those boxes of dried fruit in the supermarkets with the longest list of incomprehensible ingredients and very little actual fruit. Orange, cedro lemon and melon are all required in a panforte. Cavallucci are similar to old Tuscan men: rustic and bashful on the outside, sweet and generous inside. Spices are a constant in Sienese pastry art, especially at Christmas. 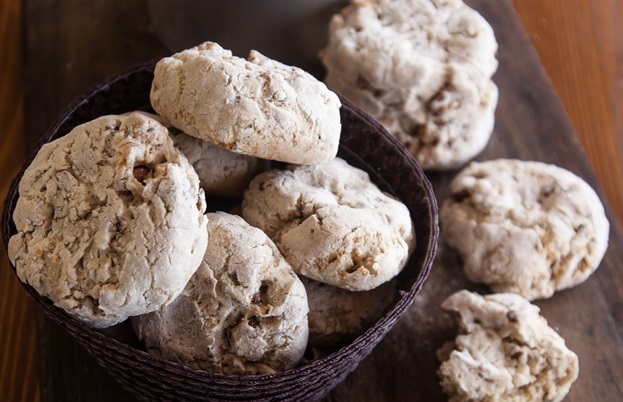 The same spiced medieval aroma can also be found in cavallucci. In Italy, 8 December is a holiday dedicated to Saint Mary, when usually we trim the tree and start making Christmas biscuits. Sienese Christmas cookies are neither pretty nor colourful: they are round, a bit flat on top and dusted with flour. They are very similar to an old Tuscan man: rustic and bashful on the outside, sweet and generous inside, bursting with nuts, candied fruit and spices. 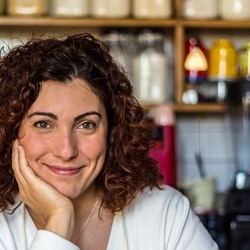 You can find tons of cavallucci recipes, but if you want to make amazing biscuits, there is only one way – head to your favourite traditional shop, one of those that sell sweets, coffee and candies, and ask for their special dose. They will sell you not just the ingredients but also their unique method. 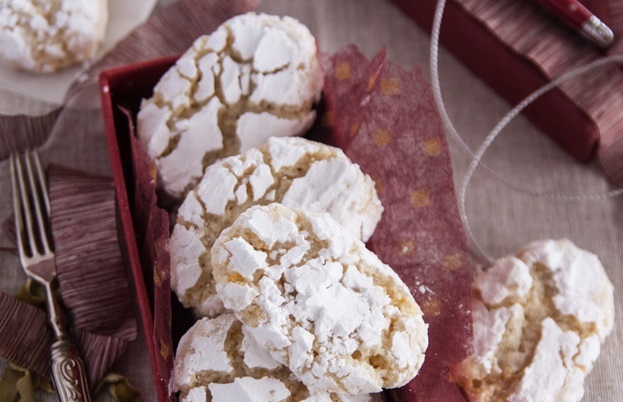 Another medieval treat which is present on every Sienese table at Christmas is ricciarelli di Siena. 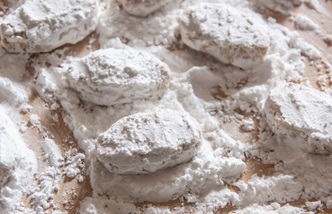 These are soft almond cookies covered with icing sugar with a soft heart that melts in your mouth, fresh and moist, characterized by the piercing smell of bitter almonds. The origin of ricciarelli dates back to the fifteenth century, when almond paste – in the form of marzipan or marzapanetti – was once very popular in the town and Siena was famous across Italy for its production. The cookies were usually reserved for the sumptuous banquets lords used to host because they were made of precious ingredients, mainly almonds and sugar. They were so valuable and refined that marzipan sweets were sold in the apothecaries’ shops along with drugs and the most exotic spices of the time. Nowadays you can find ricciarelli in every bar, pastry shop and bakery in Siena; you can choose between the classic variety, black ricciarelli, made with cocoa or a version for sweet-toothed people, biscuits covered with dark chocolate. Almonds and a paper-thin sheet of wafer are used also to make copate – a round, thin sweet treat where almonds, honey and sugar are held together by egg whites, just like in a nougat.